For the second consecutive time, Swissport Zurich has won the prestigious “Best Ground Handling Agent of the Year in Customer Services” award. Swissport was awarded two more distinctions for its Zurich airport performance. In addition to the “Best Ground Handling Agent of the Year in Customer Services 2017” award, Cathay Pacific Zurich together with Swissport Zurich also received the “Best European Airport Performance 2017” award for the second time in succession and took third place in the “Airport of the year 2017” category, with competition from all 98 stations on Cathay Pacific’s route network. In order to meet the needs and wishes of its customer airlines in the best possible way, Swissport Zurich maintains various teams – the so-called “dedication teams”. 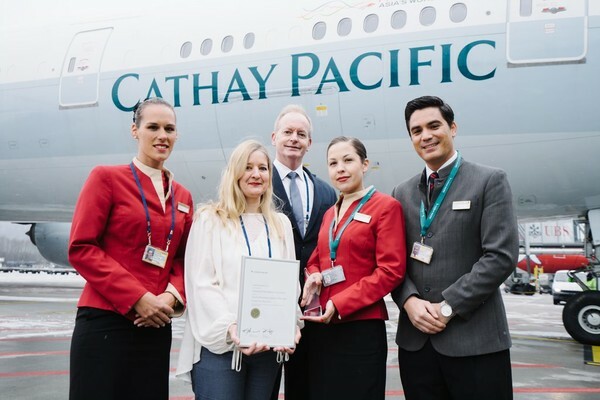 One of these is the Cathay Pacific Team, which has been specially trained according to Hong Kong specifications and is fully geared to the customer’s needs. Thanks to our Asian team members, information in Cantonese and Mandarin is always available in addition to German, French and English. Swissport International Ltd., on behalf of more than 850 client-companies, provides best-in-class airport ground services for some 265 million passengers annually, and handles approximately 4.7 million tonnes of air cargo at 133 warehouses world-wide. Several of its warehouses have been certified for Pharmaceutical Logistics by IATA’s CEIV. With a workforce of 68,000, the world’s leading provider of ground and air cargo services is active at 315 airports in 50 countries across all five continents. In 2017, the group generated consolidated operating revenue of EUR 2.8 billion. This entry was posted in Airlines, Airports, Flights, Travel, Travel Awards, Travel Management, Travel Services and tagged airlines, airport, award, Cathay Pacific, Ground Handling Agent, Swissport Zurich, travel. Bookmark the permalink.